Trying to work out the best update model for the different repo's is starting to take shape for core and main. There will be two kernels in use, one stable, well-tested, only available once a new major release reaches 3.x.8 or above, the unstable kernel is linux-next, and is fully following upstream releases. This way, linux-next will be an excellent test ground for the next stable release. KDE has made 4.11 pre-releases available, and after testing those for 3 weeks, there are no issues to stop from moving to 4.11 early, 4.10.90 has moved to the stable repo's. Work continues to give KaOS it's own identity with new custom themes. 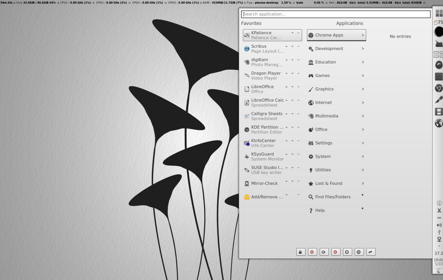 In use is now a grayscale theme for grub, kdm, ksplash and wallpaper. Gfxboot is not fully converted yet. For the foreseeable future there will be no public release though. Where development currently is for this distro, it is far better and easier to keep it as private.